uses Paypal as its payment processor. Paypal has over 100 million users, and has processed over a billion dollars in transactions. Be assured that your transaction to purchase is very secure, and... you do not need a Paypal account to pay via this method. Simply click that you do not have an account after checkout, and follow the screens to complete your purchase. Please do not use PO Box for shipping. We use Fedex Ground, and can only ship to actual addresses. 208 Pages, Full Color, 9.5 x 13 in., 5 lbs. 50+ Unforgettable color, 1000 pixel images for screensavers and/or desktop wallpapers. 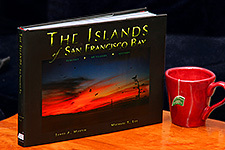 As indicated, you can order The Islands of San Francisco Bay at a reduced price through this site. Naturally, you don't pay shipping when purchasing from a store that carries The Islands Book. We have dropped the price on our site so that the total cost (with shipping) will be what you could expect to pay at any store. As a bonus, though, you can request a personalized signature message for books you order here. Just fill out the "comments" section when ordering!